Are you on the verge of putting your property up for sale? Did you know there are some basic cleaning services that actually add value to your home or business? A buyer’s first impression can make the difference between a swift sale and your property languishing on the market indefinitely. And with British Columbia’s real estate market currently white hot; it is essential to remain ahead of the pack. We can help boost that curb appeal with our Peachland Pressure Washing Service. All exterior areas and items are affected by the wear and tear of everyday life, not to mention exposure to the elements. You might see a build-up of green algae, black discolouration and moss as well as other unsightly stains on the building or its surroundings. 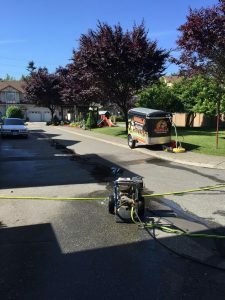 Our Peachland Pressure Washing Service is exceptionally effective at eradicating these issues. No matter the material (vinyl, stucco, concrete etc.) or the surface (decks, patios, railings, walkways etc. ), our Gorillas will have it spotless and looking its best in no time. Our process is simple but highly efficient. We start by treating the area with a disinfectant and algae remover which gradually strips away the grime that has built up over time. Next our technicians bust out the ‘Gorilla Brushes’ which, surprisingly, are not used to maintain a shiny coat but to remove any leftover gunk from the area being treated. Finally, we carry out a complete pressure washing using our seamless wand system, supported by our extensive ‘completely clean’ training. And that’s not all! Each of our ‘Gorilla Mobiles’ is fully outfitted with a bucket truck and its own water source! This means those once hard-to-reach places are a breeze with the help of Gorilla Property Services Peachland Pressure Washing. We leave no stone unturned and you’ll be delighted with the results.